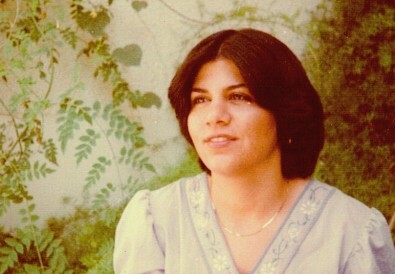 The above article refers to ten young women in Iran, 25 years ago today, who were killed for being Bahá’í. One of them, Shrin Dalvand, was Ladan’s aunt. 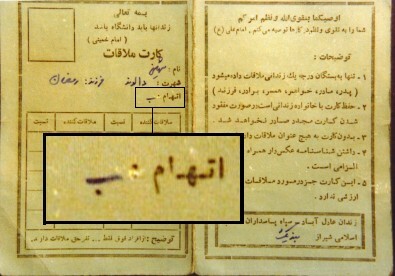 Most of Shirin’s family were living in the UK by 1983, when Shirin was arrested a visiting card was issued to a family member to see her in prison before the execution, below is a photo of that visiting card, enlarged is the section where the crime is detailed, in that space it simply has the letter “B”. Between 1979 and 1998 more than 200 members of the Bahá’í Faith were killed in Iran. The persecution of the Bahá’í, however, did not stop with the last execution. Two years ago the Bahá’í community found evidence that a systematic campaign was under way to identify members of the Bahá’í Faith and monitor their activities. Bahá’í youth, who had earlier been permitted to return to education when universities sopped asking a person’s religion upon enrolment, are again being denied access to, or continuation of, higher education at the point where it becomes known that they are Bahá’í. Most recently, seven individuals who formed an ad-hoc coordinating committee for the Bahá’í in Iran , were arrested and are being held incommunicado. Mrs. Fariba Kamalabadi, Mr. Jamaloddin Khanjani, Mr. Afif Naeimi, Mr. Saeid Rezaie, Mr. Behrouz Tavakkoli, and Mr. Vahid Tizfahm were arrested in Tehran on 14th may, Mrs. Mahvash Sabet was arrested in Mashhad on 5th March. The Bahá’í community, around the world, are seriously concerned for their safety in this escalation which is reminiscent of similar events in the early 80’s when members of two national governing bodies of the Iranian Bahá’í either went missing or were executed.